At CIA we have begun to offer exclusive training and extra courses for students who wish to go abroad to study and would like extra preparation. We also have classes that help students who wish to study locally to put together application forms and provide overall assistance for the application process. 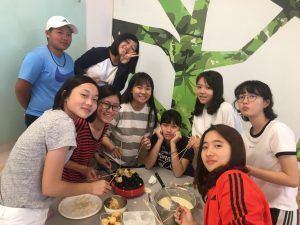 We have begun to offer these classes on Friday mornings, and as a result, have been able to free up Friday afternoons for specialized English/Language camps! This past week, Koichi Sensei and some of the international Japanese students from the CTBC College taught CIA students how to make takoyaki! If you have ever been to a night market in Taiwan, you have seen takoyaki. The takoyaki stand usually has a line. It is the delicious battered and fried balls with octopus inside and other quintessential Japanese flavours; pickled ginger, green onion and sometimes tempura flakes. The students had to get their hands dirty in order to learn more about the food rich Japanese culture! The students took a spin on the original takoyaki and made theirs with ham, cheese, and some spices. It was a great opportunity to learn how to make a traditional Japanese snack by true Japanese locals! Bon appetit, girls! They’ll be Michelin star chefs in no time.